Such empathy and concern...it must be the Christmas season. 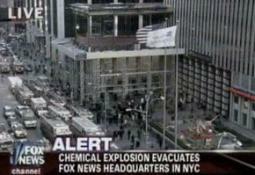 Who among us would have wept if Fox News HQ had been blown up? I can honestly say I wouldn't've. We could only wish. Those hate-filled bigots should be taken off the air ASAP! Fox News being destroyed is one of the best things that could happen. If something happens to FOX News and one of those Bush enablers get's [sic] hurt...who cares? How many have died because they helped this administration lie us into a war? Too bad the entire building wasn't taken out. US *always* needs to be on the lookout for false flag operations. First thing to consider is who would benefit from such an attack. What agenda would be facilitatd [sic] by such actions? The nicest things happen to the nicest people! Burnt to a crisp would be ideal! I think this may be something trumped up, and they WILL blame Democrats on it. I bet all of the snooz casters farted at the same time,causimg [sic] a stinking explosion. It seems to me that lots of places where the Bush administration would like to have "ears" gets evacuated for varioud [sic] reasons. Clinton campaign, WTC, Kerry campaign, and so on. Maybe I'm too sensitive to these things, but it just seems to me like these evacuations are not coincidences. Fox News must be in need of monitoring now. Fascism cannot trust even its own. Blow up the whole [expletive deleted] building, nobody will notice the difference. It is good to know that, during this Christmas season, the spirits of tolerance and compassion still bloom in the echo chamber of the Fox haters. Good Luck with B. Husein Obama in '08 since the Adulter Reverend Bill Clinton is messing things up for his fat wife in the media left and right.....!! I doubt that a Christmas spirit is anything they would possess, or care to for that matter. I think we too can forget about a piteous humanist concern for life and well being to be expressed by them as well since, I suspect this is yet another thing beyond their comprehension. These are some sick puppies (no offense to puppies!). "Those hate-filled" Bush-bots!" the angry liberal screamed, spittle flying from his contorted "Dirty bomb ain't good enough for 'em! They should be taken off the air!" Ya, and WE'RE the crazy brainwashed ones. I can only imagine the comments and libtard response if it happened at Pinchy's Place. Oh, the outrage! We have Muslim Rage Boy. Why don't we have a contest for Liberal Rage Boy? Or girl, you could throw Code Pinko in there too. The Politics of Perpetual Outrage! Well, it's a livin' I suppose. BTW has anyone noticed how much BETTER we are at this than the LLLs? How do they answer in response to MOONBAT, LIBTARD and TINFOIL HAT, which were instant successes and are now part of the lexicon? Repug, Rethug, General Betrayus, BusHitler. I've seen more talent and rhythm among third-graders! You know what it comes down to? We know what a lexicon is and they don't. We're not Neo-Cons, we're Lexi-Cons, ha ha ha! Take that, ya dumb bong-tugging libtard moonbat tinfoil hats! Gee Madking you are so right. So much BETTER! Moonbat, Libtard, and Tinfoil Hat cut to the bone for sure. Amazing what you have done to make us feel so bad inside. Have you no heart? And to capitalize them is just too much for us to take just because we don't know what a lexicon is. Drudge's headline was so vague about this that the first thing I thought was that some newshound or other psychotic individual bombed Fox. I was glad to see that it was a HVAC problem and not something more sinister. As a netizen outside of the US, I was interested to note that members of the American Left are just as intolerant as their counterparts on the Right (whose intolerance they so loudly and frequently denounce). "Good, the fire was at Fox News - let 'em die!" seems to be the sentiment expressed. Freedom of Expression is clearly still cherished by the American people - "As long as as it's the Freedom of OUR Expression, and not THEIRS!"